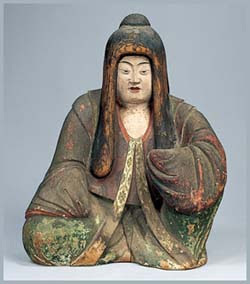 She was the wife of the 14th Emperor, Chuuai who reigned from 192 - 200. 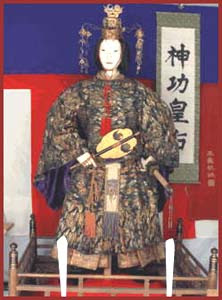 According to the Nihonshoki, after the death of her husband, she crossed over the sea to conquer three Korean Kingdoms, Koguryo, Paekche and Silla while pregnant with the future Emperor, Oojin 応神天皇. After her return to Japan she gave birth (after many years of legendary pregnancy) and returned back to Yamato with the baby Oojin to punish those who didn't accept him and reigned in his name. Nihonshoki also says that Himiko should be another name of Jingu but many historians don't agree with this thesis. Legend has it she had a pair of divine jewels (the Tide Jewels) that allowed her to control the tides when she began her bloodless conquest of Korea. 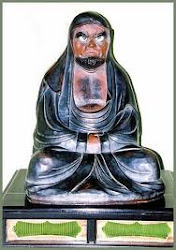 Her son is also known as Hachiman　八幡, later being subject to the Hachiman belief originating in Usa, where the main shrine of the present Hachiman Cult is located. Jinguu Koogoo is venerated as a Godess for Easy Childbirth and Warfare at Sea. This is the head shrine of more than 40,000 Hachiman shrines throughout the country. It is one of the three most revered shrines in all of Japan. (The other two main shrines are Izumo and Ise). Built in the Edo period this huge shrine is a national treasure.
. Hachiman Shrines in Japan .
. Konda Hachimanguu 誉田八幡宮 / 譽田八幡宮 Konda Hachiman . 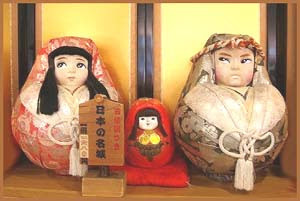 She is well known in relation to many local legends, Daruma dolls and hina dolls in Japan. Here I list a few featured in the Darumapedia.
. Awashima Matsuri 淡島祭 . The Shrine Awashima in Wakayama is said to date back to the 3rd century and the legendary empress Jinmu. and nagashibina 流し雛 "floating old hina dolls"
. Nada Fighting Festival (Nada no Kenka Matsuri)　. Nagata Shrine was founded by Empress Jingu Kogo at the beginning of the 3rd century, when she came back from her war with Korea and was on her way to Kyoto. the shrine Ikuta jinja 生田神社 in central Kobe to honor Kotoshiro nushi no kami 事代主神, the son of Okuninushi no mikoto 大国主命, known as Ebisu in Buddhism.
. the "Eight shrines of Kobe" 神戸八社 . A place for happy couples and weddings. and the ushi oni, gyuuki 牛鬼 "bull-demon"
Okinagatarashihime no Mikoto 息長帯日 (aka Empress Jingū 神功皇后). The four are known collectively as the Sumiyoshi Ōkami 住吉大神 (the great gods of Sumiyoshi; also called the Sumiyoshi no Ōgami no Miya 住吉大神宮; also called Sumiyoshi Daijin 住吉大神). The Osaka-based Sumiyoshi Grand Shrine is also considered to be the ancestral origin of Japan's popular Hachiman deity. Hachiman, Japan's god of war, represents Emperor Ōjin (Japan's 15th emperor), who was long ago deified as the god Hachiman to protect warriors on land. His mother (Empress Jingū) was added to the Sumiyoshi triad in later times, and the three (four) are considered gods protecting sailors and those who battle on the sea, while Hachiman represents the god protecting those who battle on land. The term "Sumiyoshi" also refers to an architectural style. Three kami produced during Izanagi's purification.
. Sumiyoshi Jinja 住吉神社 Sumiyoshi Shrines in Japan . ... the link between Empress Jingu (Jingo) and trout fishing. the characters for fish 魚 and divination 占. This recalls the famous Nihon shoki (Kojiki) incident about the Empress' divination before commencing her campaign. ... a courtier from the capital (waki) who meets a woman (shite) who is fishing (either a solitary "fishing woman" onna no tsuri or as the variants have it, a fishing boat with a companion, tsure). She turns out to be Jingu's sister "Princess Toyohime", not the Empress herself.
. Hondawake no mikoto 譽田別命 Homudawake . Uozaki 魚崎（うおざき）"the cape of fish"
Jingu Kogo passed here on her war with Korea. More than 500 ships were anchored in the bay. 五百崎（いおざき）"the cape of the five hundred"